Not sure if I overlooked it, but I was wondering if you could hide elements from a custom view. For example if I drag over a module directory I'd like to be able to hide the target folder. I was wondering and hoping for the same thing. In my case, I'm using Armory for PyCharm. 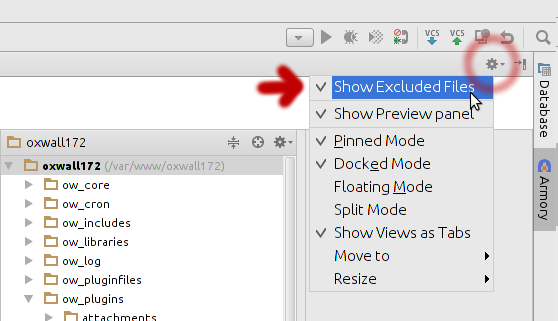 It would be great, for example, to isolate a tree view to only show a few Python classes from 2 or more modules, and exclude siblings classes from showing up in the tree view or group. Right now siblings can add a bit of clutter that results in my hunting for the correct class out of a list of other modules. I can imagine how hiding items could be a can of worms though. Some people would lose track, and forget they have certain things hidden and start pulling their hair out when they can't find stuff in the Armory tree view. Perhaps an alternative would be to grey out the "hidden" items, and make their font a 10th of the size which would make them unreadable, but that would be ok - the point is to make users aware they have stuff hidden. Just thinking out loud. Actually, that's exactly what I was looking for. The only problem is, my Armory isn't doing that on my end :( When I drag a class (just to be clear we are on the same sheet of music, that's the blue C icon) to an empty view, the new view will get populated with the specified class's respective module file (not what I wanted), plus the class (which I do want) plus all the target class's siblings (not what I want). This is different behavior than the animation you posted demonstrates. I'm using PyCharm 5.0.5 and Armory 1.31. I looked at my settings to see if I have something set to a weird value, and couldn't find anything, but at the same time, not really sure what I'm looking for. Any ideas? Using your example, let's say I wanted a view with everything in the left tree except BouncingBalls, how would I go about doing that easily? 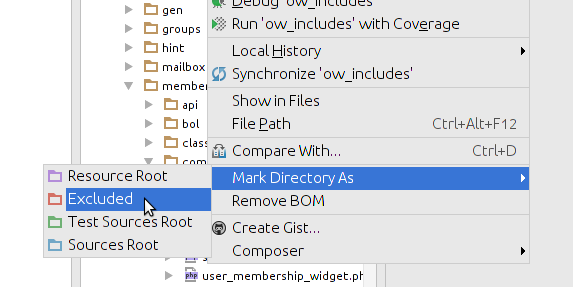 Marking the file / directory as excluded actually removes it from inspections, code completion, etc. I would still like the file to be considered as part of the project--just not some particular armory tree view that I'm currently constructing/viewing. I assume that given your suggestions, armory currently does not support my desired capability. Here is the behavior of Armoy on my end. When I drag a class to a new view, I see its parent .py file, and all other classes that come with it. Video . Give the video a second to load in the browser. Its about 1 mb. Hey, thanks for checking Oleg.